The primary goal of Sewell Retirement Services is to help our clients remove risk and worry from their financial lives. 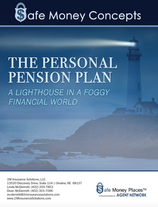 Market loss, catastrophic illness, taxes, inflation and other obstacles can all threaten a retirees nest egg. Providing education in a relaxed, non-threatening environment is our way of working. This has provided a solid foundation for servicing several hundred clients for over a quarter of a century. Steve Sewell has been in the financial services industry for more than 30 years. Steve's specialty is working with retirees and people over 55 years of age. Steve's wife, Cindy Sewell, works as the office manager. Sewell Retirement Services is located in Kokomo, Indiana with an additional office in Carmel, Indiana. This allows Steve Sewell to serve clients all over Central Indiana.